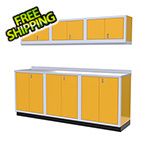 Moduline’s modular PRO II SERIES storage cabinets and tool chests represent your best option for a cabinet system to meet the unique needs of your garage or shop. 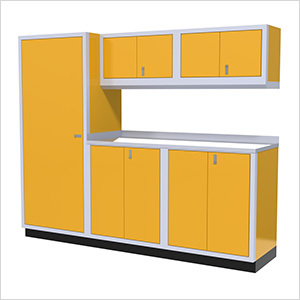 Precision and craftsmanship is embodied in every aspect of our garage storage cabinet systems, from engineered closets and drawer units to metal garage wall cabinets and mobile tool boxes. Over 25 years ago, Paul Gill started his company, Gill Metal Fab Inc., a precision sheet metal fabrication company in Massachusetts. From their humble beginnings, Paul and his team worked tirelessly on an array of jobs as they tried to build a name for themselves. As their reputation for creating high quality products grew, larger jobs came in and big name companies took notice. Soon, Paul and his team were creating pieces for projects all over the world as well as for prestigious organizations like NASA and many others. As a professional drag racer, driving one of the fastest Top Alcohol Funny Cars in the world, Paul spent almost as much time at the race track as he did at work. With all that time working on cars both at the shop and at the track, it didn’t take him long to realize he needed better quality cabinets and tool chests than what came in his race trailer. Being a precision sheet metal fabricator, he knew he could make a better quality aluminum cabinet that was lightweight yet tough enough to stand up to the everyday abuse of a professional race team. He went to work and without realizing it at first, Moduline Cabinets was born. The aluminum cabinets Paul created soon got the attention of other race teams and the word spread. Requests from other teams started to come in and what was once just a hobby was becoming a full product line and full time business for garage and trailer cabinets. From race trailers to race shops and beyond, Moduline Cabinets was developing a name synonymous with style and craftsmanship. Moduline Cabinets have since become the most sought after high end aluminum cabinet system on the market today and is now used in multiple industries around the world. 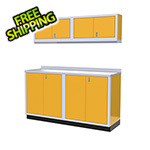 Sold internationally to race teams, manufacturing facilities, auto enthusiasts, home owners, the military, and more, Moduline Cabinets’ rugged good looks and superior build quality are perfect for any garage, mechanic shop, or trailer. Proudly made in the USA, Moduline Cabinets continues to evolve and meet the needs of its customers through innovation, technology, and staying committed to manufacturing the best products on the market. Our background in racing and precision sheet metal fabrication helps us to research and implement new developments in manufacturing, ensuring our garage cabinets and enclosed trailer accessories remain on the cutting edge. Our innovative QuikDraw® Single Action Latch System is just one example of this. Sponsoring our own Top Alcohol Funny car along with teams in IndyCar and motocross helps us stay up to date with real world track trends and the wishes of some of our most demanding and mechanically inclined customers that are on the front lines. Above all, Moduline does business with integrity. This has always been Paul’s promise to his customers. 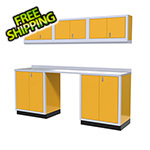 Our company strives to achieve the highest standards and treat each customer equally whether you’re in need of a single cabinet or a full on cabinet system for your garage, shop, or trailer. We look forward to helping you, so call us today!